@Raj: Usually it is one for the drivers to share. By this stage there might be a spare or second chassis. Come Australia the well-healed teams will have at least three or maybe four. Accidents and faults then tend to dictate how many more chassis they produce over the rest of the year. Any Live telecast of this ? @steve: Unfortunately not. However, it is pretty dull watching cars go round and round all day (and often there are no cars on track at all). FOM are doing some filming here as well as the TV crews from Sky and others, but it's not like a race weekend with cameras at each corner. Also just wanted to know does the new paint in the Ferrari have any aero advantages ??? @hardik: I've heard a lot about this special paint. Maybe I'm not very observant, but it didn't look that different to me when I was in Jerez. Heard some comments that it was to reduce reflection and imptove visibility of the logos of Sponsors?? @hardik: I believe it was a photographer who came up with those theories and they get to see the cars close up a lot of the time. I suspect it's more about sponsors than aero gain, but it's true that teams are fastidious about getting a perfect paint finish (or sometimes having no paint at all) for aero purposes. Vettel is back up and runnning by the way. He's just completed his third lap of the day. Just how sly & cunning is Ron Dennis, is it possible he is holding his cards very close to his chest this year? I have a sneaky feeling that they are hiding alot, and saving the best for last, albeit with reliability risk. It will be pretty exciting if they blindside everyone in Melbourne with a top 3 car. @F1_v10: I don't think McLaren is holding anything back on purpose. If they could get the Honda engine running at 100% they would do it immediately. Finding problems is what testing is all about, but you can't do that without pushing the car to the limit. Nate, Laurence do you have any news about the new seal on the MGUK of the Mclaren has arrived as reported ?? The faulty part which cut short running on day 1? @hardik: It should be fitted to the car today. An impressive two-day turn around to diagnose, re-design, manufacture and send a new part to the track. Is rain expected right away or is the forecast onli for the afternoon ?? @hardik: We are expecting a bit of rain later today at some point. It's not raining right now. Is it true that if Manor come to the first race with the 2014 car and engine they wont be getting their price money earned last year ?? And also if they miss the first 3 races and get the 2015 spec car they will loose their money right ? @hardik: Manor can miss three races this year and still be eligible for prize money. If they can get the 2014 car to pass the necessary crash tests they might be able to run it in Australia, but the politics of F1 are grinding away in the background, so it's hard to say for sure if they will make the grid even if they manage that. 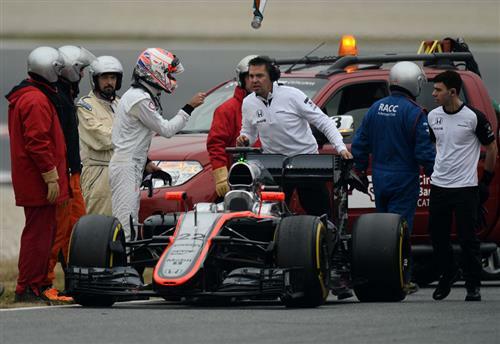 Looks like it's Button in the McLaren, he's pulled to the side of the road at Turn 7. Maybe it's that pesky Ron Dennis playing tricks on us all again. @ankur: It's entirely possible Honda has something the others do not, but Mercedes set a pretty high benchmark with last year's power unit and will only raise the bar again this year. But Honda started to design its engine two years ago, so it's questionable how much it was influenced by the others. Any idea when the new McLaren part is arriving, I know they said today so does that mean the car is still as Fernando left it yesterday. Albeit stopped on track currently! Lol! @SteveTaro: I believe it's on the car now, although clearly something still isn't quite right with the MP4-30. Hi Laurence..Is it possible that the best lap timings we've seen till now of cars running race simulations are indicative of actual potential (Like those of Ferrari and Mercedes)? @SD: Not 100% indicative because more parts will come to the cars ahead of Melbourne and it's possible to run ballast/more fuel than necessary. But the race sims give the best indication at this stage. Is the breakdown also related to the driving style because jenson had problems on day 1 and today but Fernando dint have so many issues. @hardik: I'm 99% certain it has nothing to do with it. 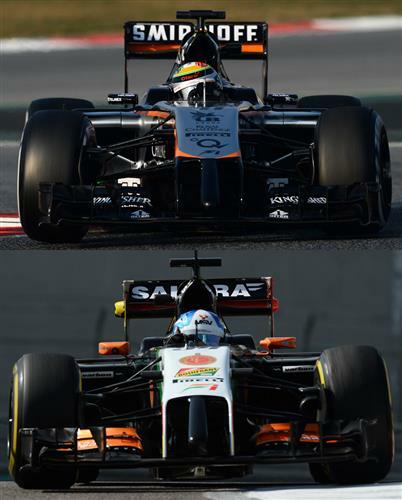 Are force india testing any 2015 parts or is it just the tyres. @Behzinga: Here's what Force India chief race engineer Tom McCullough said the team achieved yesterday: "Our main objectives of the day were for Sergio to get to know his new engineering team better, in addition to lots of setup and procedural work. 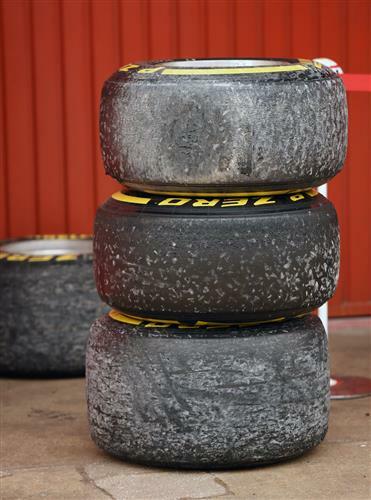 We continued the evaluation of the 2015 Pirelli tyres we started yesterday, working through performance running in the morning and long runs in the afternoon. The data we gathered today will be really useful not just for the first few races, but also for the final test next week. We are looking forward to continuing our testing programme over the final two days." Honda are development demons, a lot of people forget they didn't leave motorsport entirely when they left F1 in 2008. They run a 2.2 V6 in IndyCar and have experience from running hybrid systems in the CRZ GT300. While the technology isn't directly transferable the experience certainly is. I have faith, even if you call me a stubborn McLaren fan ???? The track has gone green but there's no rush to get back out there again. @SteveTaro: They also continued to work on a variety of projects in their R&D plant, including the 2009 car for longer than you might expect for a company that had left the sport. They may well have something up their sleeve this year. Pascal Wehrlein - whose name nobody seems entirely sure how to pronounce - heads out on track. The German youngster driving for Force India today. @laurence, I certainly hope so. From what all the teams have shown us in testing thus far I feel this year may well be closer between everyone. 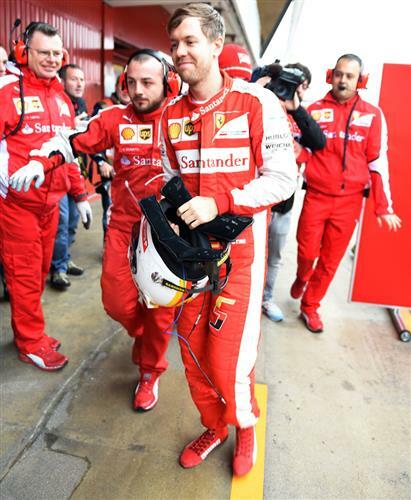 Merc might not be too concerned at this stage but Ferrari certainly have their attention. What do you guys feel the spread of performance is like across the grid this year? As someone in the press room here has pointed out, that picture of Button looks like he is tickling a marshal's ear with a long, red stick. I can confirm that wasn't the case. Hamilton and Vettel - winners of six of the last seven world championships between them - are lapping fairly closely to each other out there. Hamilton has just crossed for lap 22 of the morning.